This beautiful, authentic African Black Soap is traditionally handcrafted and fairly traded with women’s co operatives in Ghana, West Africa. It is made with 50% pure, organically grown shea butter and wildcrafted palm oil. The lye that is used in the saponification process, is made from the ash of dried cocoa pods. 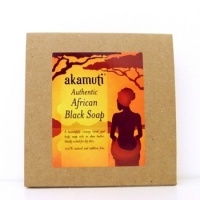 Our African black soap has a very mild scent and a wonderful creamy lather, which leaves your skin moisturised and soft. 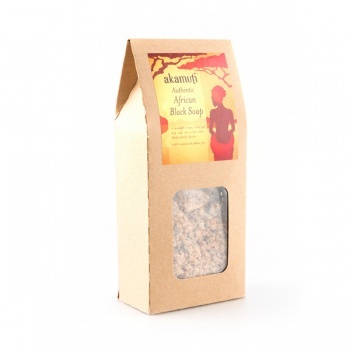 African Black Soap is one of the healthiest soaps for the skin due to the purity and simplicity of the ingredients. It leaves the skin smooth and soft and as a facial soap it is excellent for dry and problem skin. As a body soap, it is suitable for ALL skin types. This soap comes packaged in fully recyclable paper and cardboard (made from 70% recycled cardboard).